So to make a long story short, my eldest son is not joining the Navy. He is no longer enlisted for reasons that are for him to explain to those he chooses, or not, should he choose to have them remain private. And yes, it goes without saying, that he retained full approval over my publishing this post. For those of you that follow my blog, I posted about his enlistment several weeks ago. I have removed that prior post to spare him the lingering reminder of what is no longer an option – not because of any embarrassment on our part – lest anyone be thinking otherwise. His father and I are prouder now of our eldest son than we have ever been. And should anyone else feel inclined to say differently? Them’s fightin’ words. I wasn’t going to write about this at all. And then, since mixing vodka with ginger ale is not a long-term solution to the frustrations of life – too many bills to pay and Absolut gets expensive – I thought writing about it might help to soothe my psyche. This thing that is no longer possible, that I wasn’t even sure was a good thing to begin with, seems suddenly inconceivable now that it’s not happening. I wasn’t “on board” as the expression goes with the whole idea of enlisting – not at first. And then I saw how this eldest son of mine went from a frustrated, angry young man with no direction to one with a vision for his future. Cliché though it may be, it’s amazing what imagining a true purpose in life can do for your general outlook. And if you haven’t had a child that struggles to find his footing, you can’t appreciate the difference it makes in your own emotional well-being (not to mention that of your entire household) when they land on solid ground. Whoever said that thing about your only as happy as your unhappiest child? Word. So the fact that he was ready to make this eight-year commitment – yes, to the government and to his country – but MOST importantly to his own future, became something that we came in short order to support wholeheartedly. He wanted it, so we wanted it – it was that simple. So, oh the irony (yes, Ms. Morrisette http://fgk.hanau.net/articles/ironic.html, this is ironic) when, after he made the necessary life changes committing himself to this serious endeavor, researched his options, was poked and prodded and tested, swore an oath, signed a contract and donned a cap, he received a letter stating that he was no longer eligible. And I am the one who fell apart. For a moment. Or possibly four days. Like I said, I’ve been self-medicating. And then last night I realized something strange about my eldest son. He has not. Not keened over what might have been. Not burst into tears with such ferocity that he had to sleep sitting up because he couldn’t breathe. 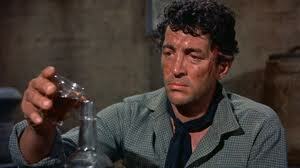 Not morphed overnight into Dean Martin in Rio Bravo, stumbling around, slurring his words and forgetting to bathe. Unlike his super-mature, vodka-swilling mother, he allowed himself some space to take it in. And then he simply hugged me and said it would be alright. That he would be alright. And I believe him. And his dad and I believe in him. He found his passion once, he will find it again. So that’s that. I’m done. Time to leave the Dean Martin impression behind. And act like a grown-up. A little something my eldest son taught me. Author’s note: In addition to my stunningly accurate impression of Dean Martin in Rio Bravo, I also managed to throw in a little Blanche Dubois from Streetcar Named Desire, and, for good measure, just a touch of Mary Tyler Moore in Ordinary People. Props to my patient husband for not drowning me in the bathtub.